On a hot summer day there is nothing better than a frosty beer. Beer was not always my libation of choice. In fact my love affair with beer is fairly recent, about 8 years old. It all began with Mexican beers served with plates of spicy Tex-Mex. Margaritas were always my first choice because I love the refreshing taste of lime with rich food. My husband convinced me to try a sip of his beer, which had a squeeze of fresh lime, and it was a revelation. Soon I was trying all kinds of beer and today beer is my libation of choice. I am utterly devoted. One of my favorite thing to do with beer, aside from drink it obviously, is find new ways to cook and bake with it. 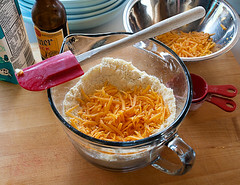 Beer has found its way into my recipes for cakes, soups, macaroni and cheese, and even pizza crust and hot dog buns. 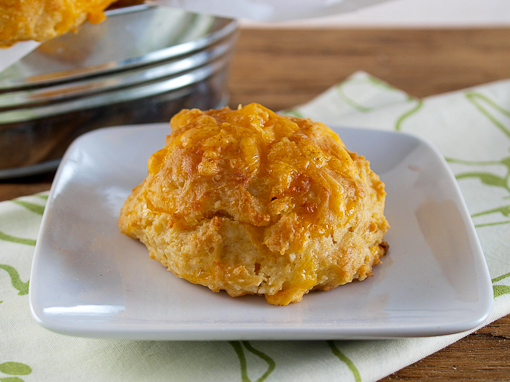 For this recipe I have concocted a rich, buttery biscuit flavored with beer and sharp cheddar cheese. This is the kind of biscuit that goes well with things like tangy barbecue, grilled steak, spicy chili, or roasted meats, and it takes practically no time to mix and bake. They are practically perfect! The beer in these biscuits should be flavorful, but nothing too strong. This is certainly not the place for a stout, but neither is it the place for a light beer. You want that distinct beer flavor, but it needs to be balanced. I used Shiner Bock, my favorite Texas beer, but any ale or pilsner should be fine here. Now, when it comes to the cheese I say the sharper the better! The sharpness of the cheddar cuts some of the richness from the butter, and oh and there is a lot of butter, while complimenting the yeasty flavor of the beer. 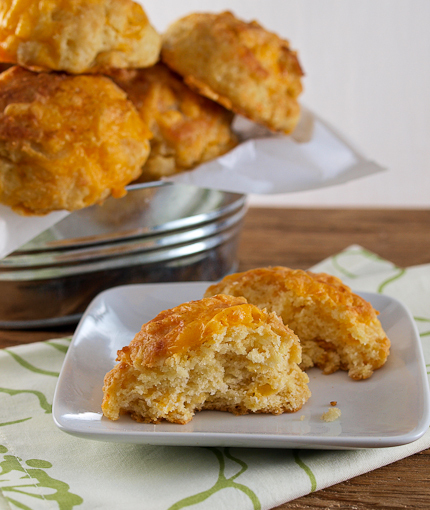 These biscuits have a flavor reminiscent of a cheese straw, or even cheese crackers. Bake these fresh for the best flavor. You can make up the dough and get it all scooped out up to an hour in advance, just keep it in the refrigerator until you are ready to bake. 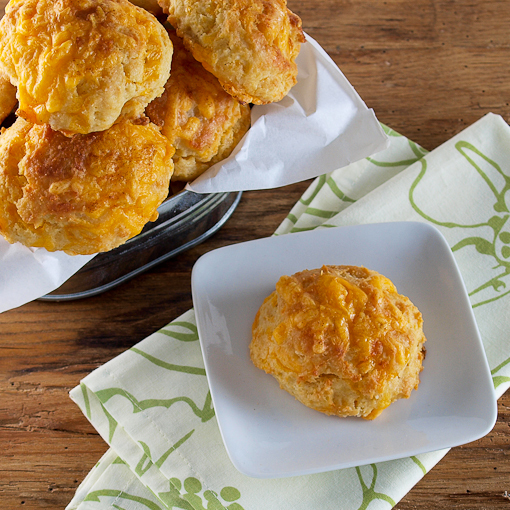 Any sooner than than and your biscuits will not bake up as fluffy. Heat the oven to 350 F and line a baking sheet with parchment paper lightly sprayed with non-stick cooking spray. 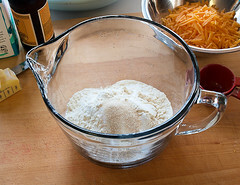 In a large bowl combine the flour, baking powder, baking soda, salt, and sugar. Whisk to combine. Next, add the cubed butter and, with your fingers, rub it in until the mixture resembles coarse sand with only pea sized pieces of butter remaining. 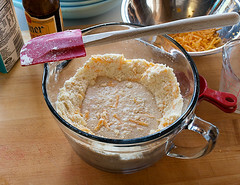 Add 1 cup of the shredded cheese and toss to combine. 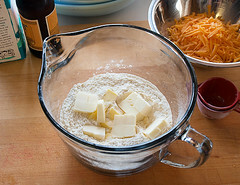 Make a well into the center of the dry ingredients and add the buttermilk and beer. Gently fold the ingredients until just combined, about 12 strokes. 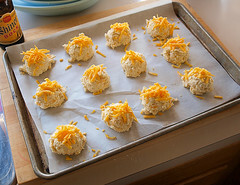 Scoop the biscuits onto the prepared baking sheet then top each biscuit with a little of the reserved cheese. 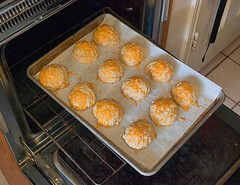 Bake for 12 to 15 minutes, or until the biscuits are firm to the touch and just golden brown on the bottom. 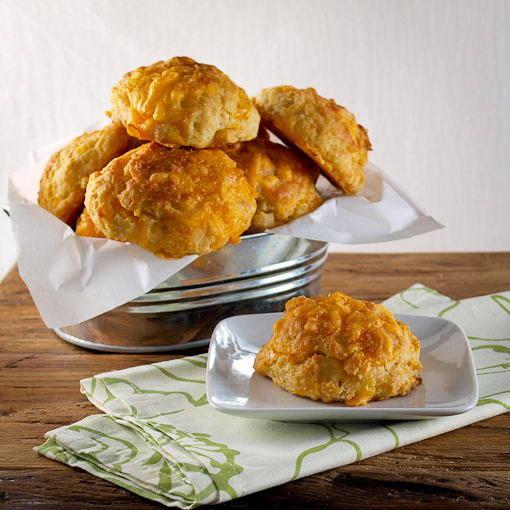 Brush each biscuit with melted butter and place under the broiler for 1-2 minutes, or until golden brown on the top. Cool for 3 minutes before serving.